And where can one get this stuff? Well, did you know that Lids sells more than hats? Well, in case you didn’t know, Lids sells more than hats! They sell all sorts of sports stuff, including MLB stuff! Every now and then they send out an email advertising their clearance section, and this week they have markdowns of up to 85% off! The key to finding the goods is to sort by “top sellers” and then go straight to the last page. The first page is usually Decent Stuff (Royals, Cubs and Astros World Series swag, pretty decent Dodgers and White Sox hats, etc. ), but the last page…that’s where you find the depths of MLB’s Stuff Creation. As of now there are 306 pages worth of stuff! A couple of years ago we looked at the best/worst hats from a previous Lids sale. What follows today is some of the best, but maybe also the worst, and certainly not ALL, non-hat items from the Lids clearance sale. Fill your carts, people — let’s go shopping! PS: I’m losing it over here. Send help. Please, someone sign someone. 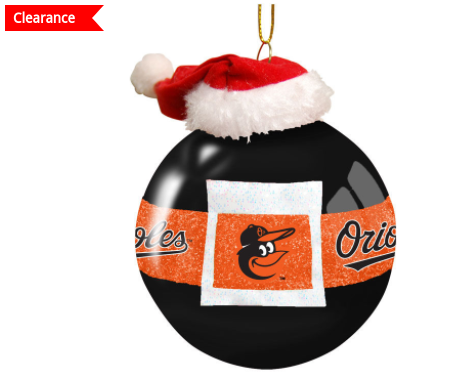 Maybe the worst selling item in the MLB clearance section on Lids dot com right now (since it’s the last item on the last page when sorted by Top Sellers) is this Baltimore Orioles Christmas tree ornament, perhaps in part because the Orioles never sign any players in advance of the holidays, instead waiting until February or March, making Mallory Rubin very sad and in the process making the holidays not very happy for their fans. Cheer up Mallory with this ornament. Perhaps I could interest you in a Mariano Rivera commemorative pitching rubber? You could place it in any number of places, like on the floor or on a wall! Giancarlo Stanton won the NL MVP award on November 16, 2017, and was traded to the Yankees on December 9. That means the Marlins had the reigning MVP on their team for 23 days. Relive those 23 days with this Giancarlo Stanton MVP t-shirt on which he is wearing a Marlins jersey. So you can remember the Good Old Days. How much more entertaining but also terrifying would the Reds be if they made this pillow pet their actual mascot? The description text for the Philadelphia Phillies oxford woven tie includes “Represent your team while remaining prepared for any situation” which I can only imagine refers to those moments when you’re setting up for a presentation and the powerpoint isn’t working so instead you turn the room’s attention to your Phillies tie that’s actually fairly subtle in design, and boy isn’t that Mickey Moniak gonna be good someday maybe? Here’s a Brewers player photo for $1 but I have no idea who this player is and also the description doesn’t say. Why not take a chance, it’s only a buck! Trying to find the Mariners logo on this button-up is not unlike a page of Where’s Waldo. Depending on the situation the logo might even be tucked in, but even then at least YOU would know that you’re repping the team in that moment, even if nobody else knows. Did your acquaintance just recently have a baby? Are you a big Dodger fan? Are you trying to ensure that this new human grows up to also be a Dodger fan? Then buy that baby these adorable Dodgers ladybug pattern socks right now. I…I think I would carry this. What’s another buck? Complete your order by getting your buddy Cole a Mets keychain!